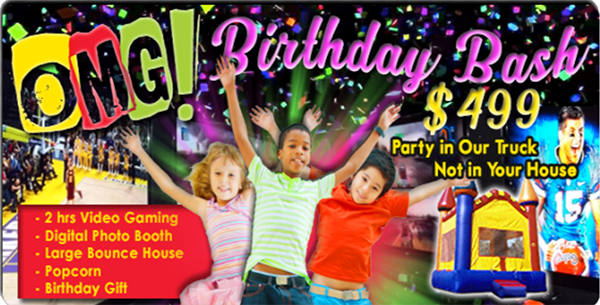 $499 for 2 Hours, $150/add’l hour, includes: Commercial Bounce House, digital photo booth with props, birthday gift and Popcorn. Additional 50 servings of popcorn +$20. Package serves up to 25 people; for parties of more than 25, we send a second attendant +$50. Residential deliveries only. Cleveland Bounce and OMG (Ohio Mobile Gaming) provide this stylish entertainment right to your doorstep or other event location. Easy for you and fun for them. No mess in the house, and everyone is guaranteed a memorable event. We even provide the invitations! Our digital photo booth includes a flash drive, for you to keep, with all the pictures taken during the event. If you would like our hard copy photo booth with unlimited pictures, just add $99. Mobile Video Gaming – What Is It? Just ask your kid. We provide the latest game consoles, video games, and some hoppin’ music. Each of our trucks has 5 video screens for indoor and outdoor entertainment with the ability to handle up to 20 players at one time. If you want a competitive tournament, we can supply tournament brackets, prizes , and the VIP can determine the games. OMG’s Cleveland gaming theaters are fully-customized enclosed trailers. In the climate controlled theater you will find extra-large high-definition monitors, upholstered theater style seating, professional sound system, and enough room to get up and move around! On the outside of the gaming theater we provide a 12′ awning covering another digital outdoor play area. This entire set-up is self-powered and can be used anywhere we can fit it! The unit was designed with competitive gaming in mind … so it’s time to polish up on your Halo:Reach, Madden, and Call of Duty skills. 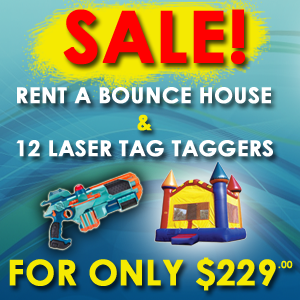 We have the latest racing games, party games, sports games and more! 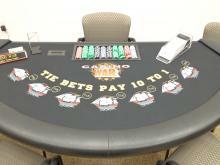 Mobile Video Game Parties are ideal for birthday parties, fundraisers, and corporate events. Tied of the same old winter birthday parties in NE Ohio? Give OMG a shot and we’re sure you’ll be back for more!